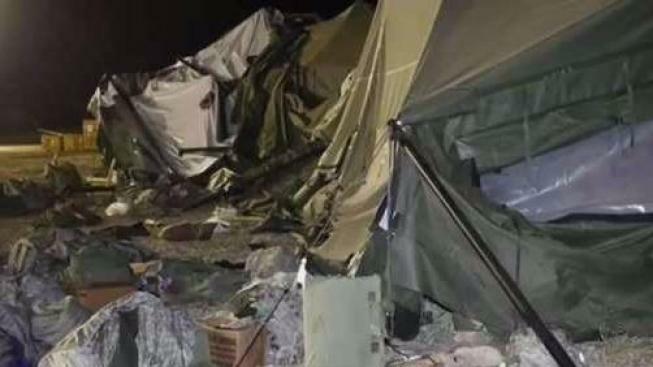 A helicopter blew down a tent at the Fort Hunter Liggett military base in California on Wednesday night, injuring 22 people, a spokeswoman said. A U.S. Army UH-60 Blackhawk helicopter was landing about 9:30 p.m. when the wind from its rotor caused the tent to collapse, said Amy Phillips, public information officer at the Monterey County base. Of the 22 reported injuries, 17 were treated at a hospital and released. Another five were treated at the scene, Phillips said Thursday. Initial reports she received said only four people had been taken to the hospital, Phillips said. Phillips said she did not know the extent of the injuries of those who were hospitalized. The accident occurred during an annual training exercise for thousands of Army, Navy, Air Force, Army National Guard, Army Reserve and Canadian Armed Forces troops. Fort Hunter Liggett is about 170 miles (270 kilometers) south of San Francisco. The sprawling base is the largest U.S. Army Reserve Command post.